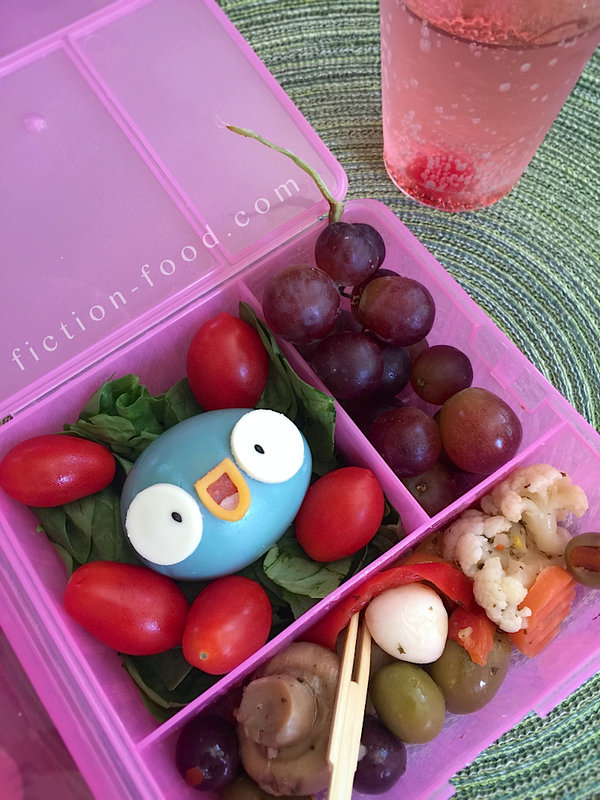 Fiction-Food Café: Harvey Beaks Egg Head + Pink Sharrie Drink! Harvey Beaks Egg Head + Pink Sharrie Drink! 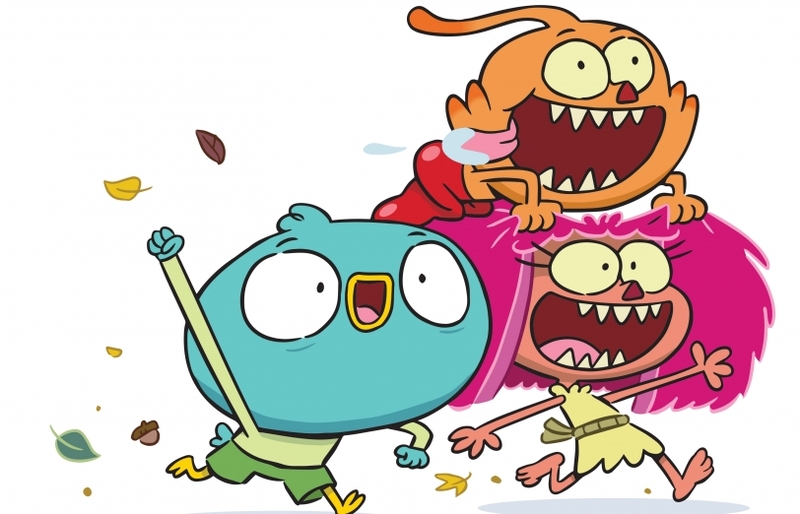 "Harvey Beaks" on Nickelodeon, created by C. H. Greenblatt. "Harvey Beaks", created by C. H. Greenblatt and airing on Nickelodeon, is the show I go to when I just want to feel good. Like, if I'm having a bad day or frustrated or simply want to relax and...feel good, I watch an episode of "Harvey Beaks". There's a feel of innocence and childhood curiosity and wonder and there's humor and bonds of family and friends and it's just wonderful. I especially love "The Spitting Tree" episode (s. 1, ep. 1b) when Harvey and his best friends, siblings Fee and Foo, jump out of a super tall tree to their waiting family and friends below. The falling scene is so magical and joyful and I can feel it in my heart. That's the kind of show "Harvey Beaks" is; heartfelt. 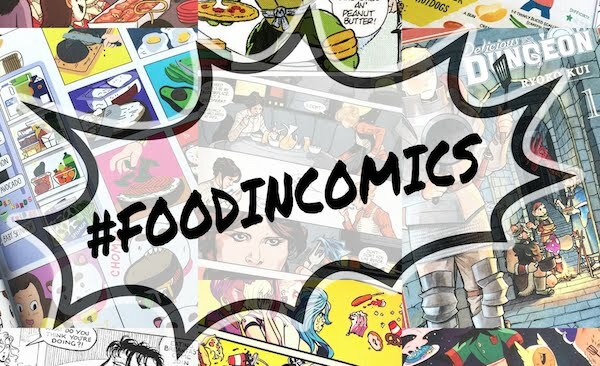 It's not rough or crude or ridiculously slapstick or preachy or psychedelic. It's good, like telling someone they're are a Good person, the kind of person you like to be with and can trust. 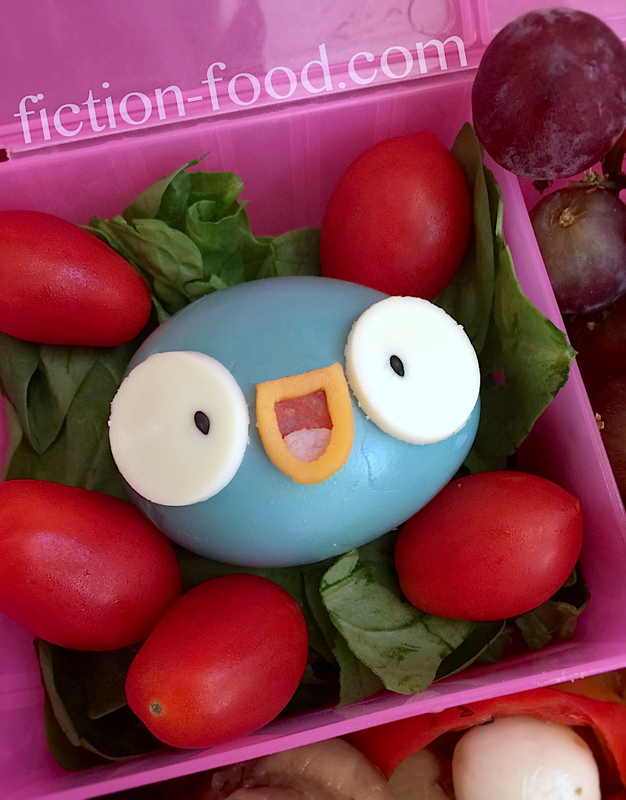 If you haven't seen "Harvey Beaks" yet, please go cozy up on your couch and check it out. 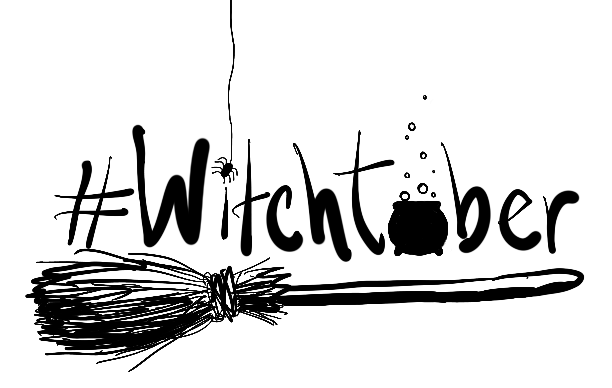 For an interview from Cartoon Brew with creator C. H. Greenblatt, click here. Note: The first part of the recipe below is a how-to for making natural food dye. It's pretty awesome! And no, your eggs won't taste like cabbage (not that that's necessarily a bad thing), or smell like it either. The directions are for one Harvey egg, but if you need to make more, feel free to double the water, cabbage leaves, and baking soda, and you can dye about four eggs at a time and then dye more after that. 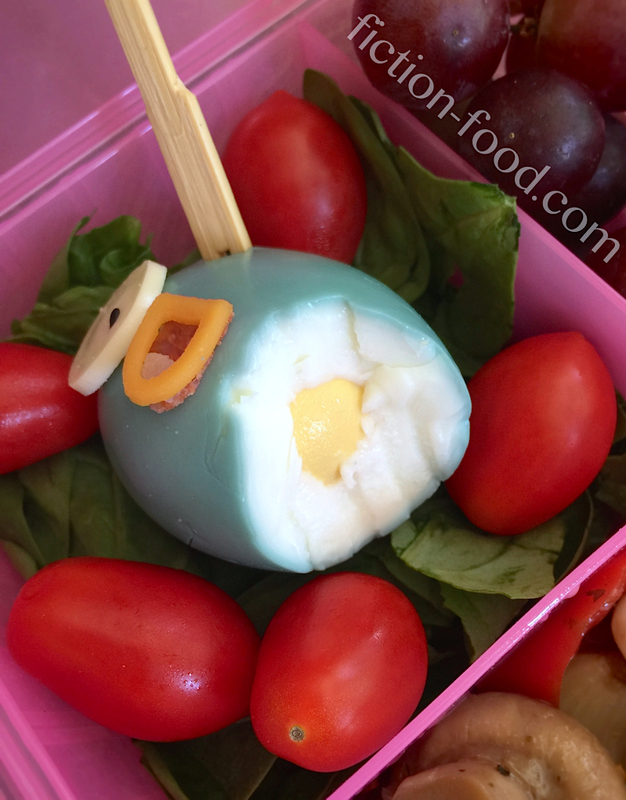 This would be a great plan for a "Harvey Beaks" party, but make sure you decorate just prior to serving. Also, the drink shown in a couple of the pictures is a Pink Sharrie or Sherrie (I think of it like cherry plus sharing so I prefer the first spelling) from the "Harvey Beaks" episode "The Sleepover's Over" (s. 1, ep. 10a). "Ah, here we go. Pink Sharries." "It's lemon-lime soda with a splash of my secret ingredient." The secret ingredient being a jar of maraschino cherries. Yum! I love maraschino cherries. So you pour a glass of lemon-lime soda, like Sprite, and then pour in just a tad of maraschino cherry juice at a time until it's a pretty pink. Stir it up to distribute the pinkness, and then plop in a cherry with stem. Share it with your friends, but don't let Fee eat all of the cherries! 1. Make the natural dye: Place the water & cabbage leaves in a medium pot & bring to a boil, turning & pressing the cabbage leaves down every so often. Let boil for a minute & then cover & reduce the heat to a simmer. Cook for about 10-15 minutes more, or until a nice deep pink-ish purple. 2. Dye the egg: Strain the liquid into a cup & stir in the baking soda. It should dissolve almost instantly & create a beautiful color change to blue, blue-ish green. Let the liquid cool down some & then plop the peeled hardboiled egg in & let set for about 15-20 minutes, or until the appropriate color. Remove the egg & pat dry on a paper towel. Place the egg in the fridge to make sure it's cooled completely (only if the dye liquid was still warm). 3. Cut out the face pieces: Print & cut out the little eye & mouth template pieces. Lay the white cheese on a cutting board & place the circle template on top. Using the craft knife (recommended) or small sharp knife, cut out 2 circles. Gently press 1 black sesame seed on each circle to complete the eyes (using tweezers is helpful because the seeds are so small!). Lay the orange cheese slice on the cutting board & place the beak template on top. Gently cut around the outside of the template & then cut the inside part out. Next, place the pepperoni on the cutting board & place the mouth back template on top & cut around the edge. Put the ham or turkey sandwich slice ont he cutting board & place the tiny tongue template piece on top & cut around it. Leyer the pieces by putting the pepperoni cut out down, then the little tongue piece on top of it at the bottom & then the beak piece over them both. 4. Decorate the egg: Lay the egg on a little bed of lettuce or spinach so that it stays put & then place the eyes on top, close to either end. Using the flat of a small knife (or your craft knife), transfer the stacked mouth pieces to the center of the egg top, between the eyes. Adjust the pieces as needed & you're all done! Add anything else to your little meal as you'd like. 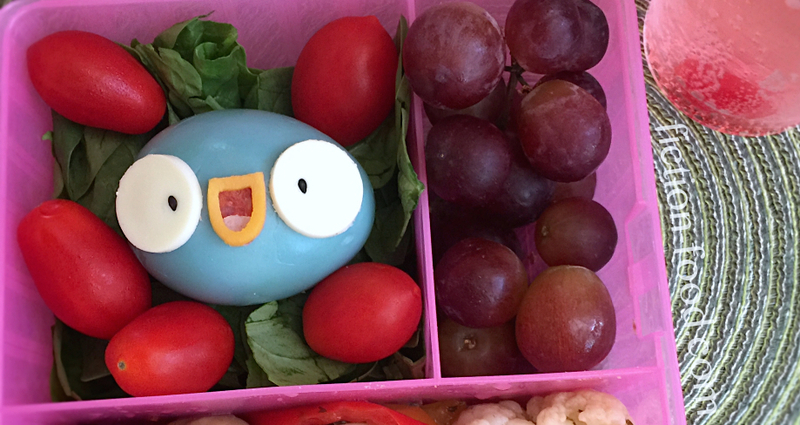 It's great as a bento, or packed lunch, & so good served with a Pink Sharrie (see note above)!